Swiss niche line Vero Profumo is celebrating its 10th anniversary with Naja1 — a limited edition fragrance. The name Naja has associations with the cobra and its semi-divine representations known as Nāgas. The Nāgas are linked to water; from India to Thailand these mythic creatures live near rivers, ponds, lakes, and often "haunt" wells. Old Hindu tradition said the part-human, part-snake beings would only bite evil people or those who would not live to be old. Art showcasing the Nāgas (and their female counterparts Nāgis or Nāginis) is wonderful. For this post I've shown the Nāga Shesha (also known as Anata), who is the Nāgarāja (king of the Nāgas); he's not only supporting Vishnu...but the entire universe. 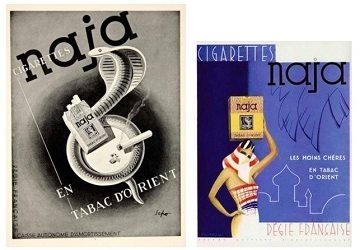 Oh, and Naja was also a brand of French cigarettes in the 1930s. Now Smell This has Vero Profumo covered; all Vero scents (except Kiki) have been reviewed. As far as I remember, Naja is the first Vero scent I've smelled. When I had my partner wear Naja he said it was like "smelling a jungle flower." This flower has a "hiss" at first sniff — a nose-pinching mix of 'honey': dripping from ripe fruit flesh, oozing from linden blossoms and seeping through dried tobacco leaves. Within minutes, Naja softens and becomes almost talc-y...and even sweeter, with dense osmanthus mixing with the scents of honeycomb and blond tobacco leaves. Naja has a vintage vibe (think pre-reformulated Caron perfumes) and wears heavily for a few hours before it disappears around hour number 5. The materials used in Naja smell superb. Since tobacco dominates Naja, I believe Naja cigarettes (and not cobras or deities) had the most influence on the perfume's development. Though melon is a listed note, I don't detect it (but there's a juicy fruitiness in Naja's opening); Naja does not conjure the underground/water-world of the Nāgas, either. I enjoy Naja but don't need to buy a bottle. I've got tobacco covered in my collection, and I've smelled the best honey perfume ever: Serge Lutens Miel de Bois. Nothing compares to Miel de Bois! (I'm afraid to sniff the current formulation; if you have, give me the scoop, whether it be heartening or heart-breaking news). 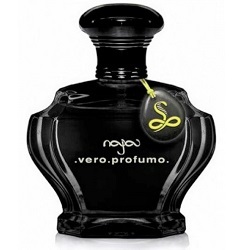 Vero Profumo Naja is available in 50 ml Eau de Parfum ($260); limited/anniversary edition of 650 bottles. For buying information, see the listing for Vero Profumo under Perfume Houses. 1. Listed notes of melon, linden, osmanthus and tobacco. 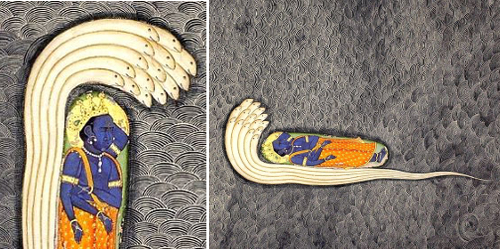 Note: top image is Vishnu Reclining on Ananta. From Sage Markandeya's Ashram and the Milky Ocean, c. 1780-1790. Mehrangarh Museum Trust., [cropped] via Wikimedia Commons. Really? I don’t normally comment on reviews, but this is ridiculous: Miel de Bois is an abomination, and mercifully bears no relation to the superb Naja, Vero Kern’s best fragrance to date, and mostly a colossal vetiver. oops I meant to make this a standalone comment! I love your book Luca and your reviews! Chandler b…oh, you should still sample Naja! LT, yes, Miel gets very little adoration, but I love it (if it still smells as it did upon its initial release). As for Naja being a ‘colossal’ vetiver, it does not smell like even a demure vetiver to me. I love your book and really respect your opinions. I haven’t smelled either perfumes so I can’t comment. I just don’t think “ridiculous” can define anyone’s opinion, especially in perfume as it is so subjective. Thank you for the review, Kevin. I’m very much looking forward to trying Naja. And I like Miel de Bois, although I can’t comment on any variation. My bottle is only a couple of years old, and I haven’t tried anything older. I almost purchased a sample of this recently and removed it at the last moment because of the listed “melon”. Glad to hear it’s not prominent (either vetiver or honey sounds much more enticing!). Doc, it’s worth getting a sample. I do find Miel de Bois stunning (don’t know how it fares now) and have a full Naja bottle on the way! Does it make me weird? ???????? Civet…it makes you smart and discerning! Ha! I would think that pretty much anyone bitten by a half cobra being would probably not be someone who is long lived. Dilana, they’d never bite unless their psychic powers alerted them to your early expiration date! I got a sample with trepidation, thinking I might fall for it the way I did with Onda. I haven’t given it a proper wear yet, because I’m still afraid of the “Onda Effect.” I can’t afford Onda and I can’t afford Naja either, should I love it. I think it’s a form of Perfume Self-Flagellation…???? Deva…I order you to wear it! It seems that every time I’ve acquired a sample of a very expensive scent that is a “holy grail” to many I have not liked it, or I wouldn’t even consider spending designer money on it, so I guess I’ve been lucky in that way. Also, I’ve found that layering is a great idea when you’ve got a lot of bottles, especially a vintage scent with a recent one. In a sense I feel like I’m the perfumer when I do that, and the results are rarely bad (but if they aren’t great just keep layering!). Bigsly, alas I get lots of samples…but lots cheaper than when I was a newbie to perfume and ordered whole bottles without trying out the perfume first. I was lucky enough to be given a sample of this scent, and it is currently at the top of my to buy list. It is an extraordinary perfume – osmanthus, apple and tobacco. the bad news is Miel de Bois has been reformulated drastically. It has become much more floral and airier with a noticeable violet note at the beginning. The drydown is still animalic but not as urinous as it used to be. the texture is now more liquid than it is viscous if that makes sense. The good news is that the reformulation is actually quite pretty if you don’t compare it to the original. a completely different take on the same theme and a beauty in its own right. I might be less of a miel de bois fan than you are (though it is one of the instances where I don’t agree with Luca T.’s take on it: I don’t find it abominable at all). Just went to the Miel de Bois review after writing this and read a comment by YSbrand from 2012 comparing Miel de Bois to violet candy: interestingly enough I’ve always found that the new version actually smells more like honey flavored hard candy than actual honey. The comment is making me think I’m not imagining the candy aspect. Glad I read this — very sad that it changed at all, and will treasure my old bottle, but you’ve convinced me I might as well try the new one at some point. Agree…must get a new sample before springing for the bell jar. I have both versions and, yes, they are different. I do like them both and think, even with the current version, it’s the best honey scent out there. Furriner: thanks for chiming in…must order a sample since there’s not a drop to be found in Seattle. Wow you got LT to yell at you Kevin. That feels like some kind of accomplishment . . . although I guess not really. My tiny sample of Naja just arrived and it smells good so far. I can detect the melon a bit, but not too much; then it’s all osmanthus and tobacco. Amy, haha! Got him to do something he normally does not do. I will think of it as an accomplishment of sorts! You should feel quite chuffed that you drew comments from both Luca Turin and Chandler Burr. I agree with Luca that Miel de Bois is (or at least was, haven’t smelled the current one) an abomination, and am looking forward to trying Naja. Just FYI, that is not Chandler Burr. Oh, sorry about that, thanks for the correction! Incorrect assumption. cazaubon: old Miel de Bois was a strange one. People would always tell me how good I smelled when I wore it…but when I gave them a spritz on their skin most would be horrified. I stopped wasting MdB on anyone! If only I had bought 10 bottles of the original version. Sounds interesting! I am tempted to get a large sample to split. Does anyone know if it’s a splash (or has a removal top) OR unremoveable atomizer bottle? hajusuuri: didn’t feel a thing! Looking at Vero Profumo on Luckyscent, the other ones with that cap are sprays. No indication whether the sprayer comes off. Thank you nozknoz! I will email to find out. Your “spank” comment had my husband and I laughing into our cups! I wish I lived in New York and we could go out for drinks. I’d come bearing organic chocolate and tripled-milled soap. Glad I made you laugh. Drinks and dinner on me when you come visit! I believe all her bottles except the extraits are crimped on atomizers. Thanks for the back story, Kevin. I always appreciate your historical and cultural insights, and especially the art that you find. I haven’t loved anything from this line so far, but Naja sounds worth a try. Oh, who am I kidding, I just want that black bottle. Noz: agree! I don’t have one black bottle of perfume…and I do like the Vero bottles. I am glad that you are one of the special people who can wear Miel de Bois – I am in the other camp (you know, the ones who smell like they’ve been cleaning a very messy litter box). I have loved all of the other Vero Profumu perfumes that I’ve tried, in particular Rubj and Onda. They have a revelatory quality that I enjoy and appreciate, and which reinforces my love of perfume. Sorry, didn’t catch that typo. Vero Profumo. Update: Vero Kern posted on facebook today said Naja will become part of the regular collection.